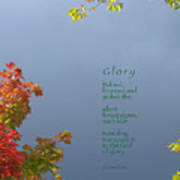 Geordie, thank you for featuring Glory in the Christian Theme Artwork Group. 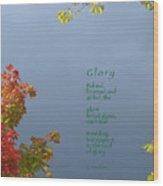 Michael, thank you very much for featuring Glory in the Comfortable Art group. Very much appreciated. Thank you for your complimentary words and for your Easter greeting, Kathy. How appropriate for His Majesty on this Easter, Morn! Beautiful, Ann. Happy Easter! Thanks for your words of affirmation, Freddy. Many thanks, Trilby. very glad you like this. Ann, what a wonderful photo and poem. Each compliments the other. Nice work. Thank you also for your comment on my picture, Worship in Wallace. I really appreciate it. Very beautiful work Ann! The poetry is wonderful! Very beautiful piece of artwork Ann. Very insiring and lovely feel. Bless you Ann. Keep up the good work. Ann, you are amazing. A truly beautiful poem set within the perfect frame of leaves. 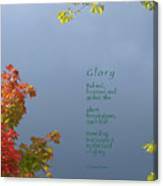 The image of autumn leaves against a sky of gathering clouds, entitled Glory copyright 1994 Ann Horn, is accompanied by an original poem, also called Glory, copyright 2009 Ann Horn. ALL RIGHTS RESERVED. 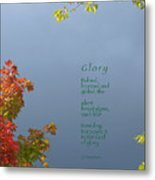 This copyrighted work does not belong to the public domain and may not be reproduced, copied, altered or manipulated in any way without the written permission of Ann Horn. ann-horn.pixels.com pixels.com Group Features: Christian Theme Artwork. Comfortable Art.